^ Alistair B. Fraser. Bad Meteorology: Raindrops are shaped like teardrops.. Pennsylvania State University. 2003-01-15 [2008-04-07]. ^ 2.0 2.1 B. Geerts. Convective and stratiform rainfall in the tropics. University of Wyoming. 2002 [2007-11-27]. ^ David Roth. Unified Surface Analysis Manual (PDF). Hydrometeorological Prediction Center. 2006 [2006-10-22]. ^ MetEd. Precipitation Type Forecasts in the Southeastern and Mid-Atlantic states. University Corporation for Atmospheric Research. 2003-03-14 [2010-01-30]. ^ Pete Wolf. Meso-Analyst Severe Weather Guide. University Corporation for Atmospheric Research. 2003-01-16 [2009-07-16]. （原始内容存档于2003-03-20）. 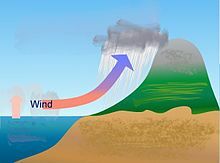 ^ Glossary of Meteorology. Graupel. American Meteorological Society. 2009 [2009-01-02]. （原始内容存档于2008-03-08）. ^ Toby N. Carlson. Mid-latitude Weather Systems. Routledge. 1991: 216 [2009-02-07]. ISBN 978-0-04-551115-0. ^ Dr. Michael Pidwirny. CHAPTER 8: Introduction to the Hydrosphere (e). Cloud Formation Processes. Physical Geography. 2008 [2009-01-01]. （原始内容存档于2008-12-20）. ^ Diana Leone. Rain supreme. Honolulu Star-Bulletin. 2002 [2008-03-19]. ^ Steven Businger and Thomas Birchard, Jr. A Bow Echo and Severe Weather Associated with a Kona Low in Hawaii. Retrieved on 2007-05-22. ^ Western Regional Climate Center. Climate of Hawaii. 2002 [2008-03-19]. ^ Paul E. Lydolph. The Climate of the Earth. Rowman & Littlefield. 1985: 333 [2009-01-02]. ISBN 978-0-86598-119-5. ^ Michael A. Mares. Encyclopedia of Deserts. University of Oklahoma Press. 1999: 252 [2009-01-02]. ISBN 978-0-8061-3146-7. ^ Adam Ganson. Geology of Death Valley. Indiana University. 2003 [2009-02-07]. ^ 上海天气预报首用通俗「毛毛雨」. 2008年5月30日 [2008年7月8日]. （原始内容存档于2014年12月23日）. ^ Emily Lakdawalla. Titan: Arizona in an Icebox?. The Planetary Society. 2004-01-21 [2005-03-28]. （原始内容存档于2005-01-24）. ^ Paul Rincon. Planet Venus: Earth's 'evil twin'. BBC News. 2005-11-07 [2010-01-25]. ^ Paul Mahaffy. Highlights of the Galileo Probe Mass Spectrometer Investigation. NASA Goddard Space Flight Center, Atmospheric Experiments Laboratory. [2007-06-06]. ^ Katharina Lodders. Jupiter Formed with More Tar than Ice. The Astrophysical Journal. 2004, 611 (1): 587–597 [2007-07-03]. Bibcode:2004ApJ...611..587L. doi:10.1086/421970. ^ Harvard University and Smithsonian Institution. New World of Iron Rain. Astrobiology Magazine. 2003-01-08 [2010-01-25]. 周淑贞. 氣象學與氣候學. 高等教育出版社. 2007. ISBN 7-040-06016-7.